Geophysical and geochemical aspects of environmental degradation (B. Bolin). Ecosystem dynamics (S. Levin, S. Pacala). Property rights, public goods, and the environment (D. Starrett). Economics of common property management regimes (J.-M. Baland, J.-P. Platteau). Population, poverty, and the natural environment (P. Dasgupta). The Theory of pollution policy (G. Helfand, P. Berck, T. Maull). Mechanism design and the environment (E. Maskin, S. Baliga). The Political economy of environmental policy (W. Oates, P. Portney). Experience with market-based environmental policy instruments (R. Stavins). Experimental evaluations of policy instruments (P. Bohm). Technological change and the environment (A. Jaffe, R. Newell, R. Stavins). The Handbook of Environmental Economics focuses on the economics of environmental externalities and environmental public goods. Volume I examines environmental degradation and policy responses from a microeconomic, institutional standpoint. Its perspective is dynamic, including a consideration of the dynamics of natural systems, and global, with attention paid to issues in both rich and poor nations. 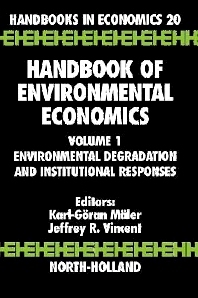 In addition to chapters on well-established topics such as the theory and practice of pollution regulation, it includes chapters on new areas of environmental economics research related to common property management regimes; population and poverty; mechanism design; political economy of regulation; experimental evaluations of policy instruments; and technological change.